Are you delving deeper into the world of coffee? Do you need a coffee brewer that makes sense for you? Whether you like your coffee flavored in French Vanilla, black without sugar, or loaded with more cream than it can reasonably handle, the process of going from coffee grounds to coffee doesn’t happen by magic. However, what many people overlook is how your coffee maker can impact the quality of your coffee. This is where the AeroPress can potentially change your coffee-drinking routine. To the untrained eye, an AeroPress looks like any other small-serve coffee maker. You wake up in the morning, proportion your coffee grounds, add water and wait. No matter how similar coffee makers might look, not all coffee is created equally. With all of this going for the AeroPress, you would expect it to be complicated. However, coffee enthusiasts who are less than tech-savvy will be pleasantly surprised by the simplicity of this coffee maker especially compared to the Jura Capresso impressa Makers. 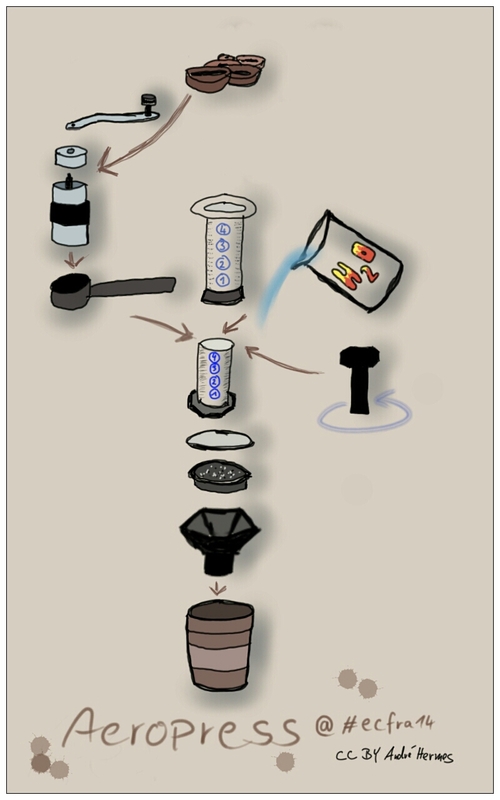 In short, the AeroPress successfully produces a better cup of coffee out of less than ten individual parts. Need AeroPress parts? check out the parts page at aeropress.ca. The system and the process are so straightforward that you don’t have to be a rocket scientist to brew excellent coffee every day with this brewer. Touting the progressiveness of a new coffee brewer is all well and good, but the proof is in the product and in what people had to say about the AeroPress after using it. People who bought the AeroPress were consistently impressed with the quality of the lattes, the 1-minute brewing process, and the ease of cleaning. On the other hand, reviewers also expressed concern about the ability of the AeroPress system to handle wear and tear over the course of several years. That being said, it has had positive reviews. Most coffee lovers look for consistent flavor, heat, and a grain-free brew in their morning cups. 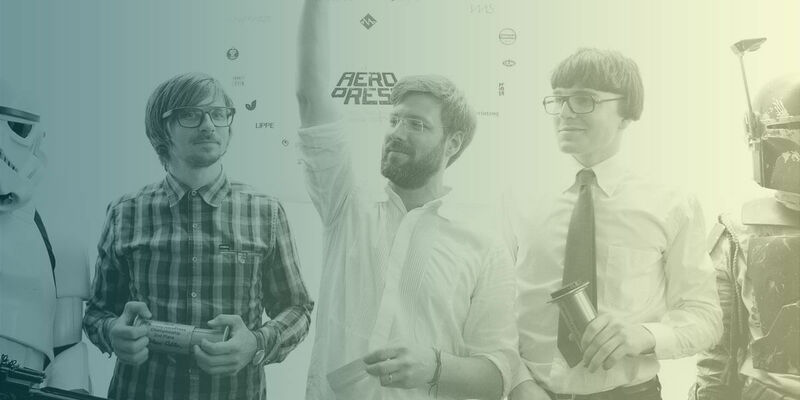 So how does the AeroPress compare with competitors? There are some who claim that you haven’t truly tasted coffee if you haven’t had an espresso made by an espresso machine. Even so, many ambitious espresso-makers have learned the hard way that there’s a fine line between a rich espresso and a bitter brew. The smallest mistakes can have catastrophic effects on homemade espresso. Cleaning espresso machines is also a notoriously time-consuming task. 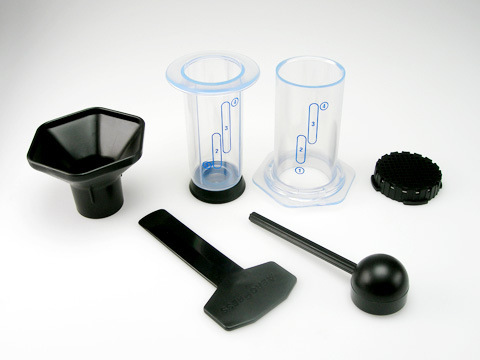 The AeroPress, in contrast, is easier to clean and to make excellent espresso. From an aesthetic standpoint, the French Press looks an awful lot like the AeroPress. Although there are visual similarities, these two coffee brewers aren’t interchangeable. First, for coffee-lovers, coffee made by a French Press often has a grit to it that requires you to drink the coffee immediately. The microfilter of the Aeropress prevents this from happening. In addition, the French Press can’t be used to make espressos and lattes. Whether you look at the French Press strictly regarding coffee quality, housekeeping, or range of use, you simply don’t get the same results as you do with the AeroPress. Okay. 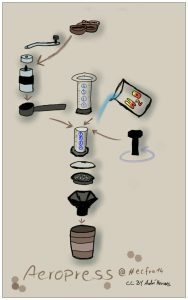 So how do exactly do you brew coffee with the AeroPress? Take a microfilter and place in the bottom of the AeroPress chamber before twisting the cap tight. Measure two scoops of ground coffee into the microfilter you arranged in the chamber during step 1. Place the chamber on top of your cup. Pour hot water of roughly 175 degrees F down the chamber. Take the paddle and stir the coffee and water together for approximately 10 seconds. Place the plunger inside the chamber and press down roughly one-quarter of an inch. Maintain pressure for 20-30 seconds. Relax and enjoy your coffee! When judging the merits of coffee, enthusiasts/snobs have various preferences. Some want flavor while others look for convenience, heat, or a combination of all three. Unique in its ability to perform all three functions in espressos, lattes, or good old-fashioned American coffee, the AeroPress is a coffee brewer that comes in a stylish package while exceeding expectations. Whether you’re tired of cleaning the espresso machine, you’re looking for a coffee brewer that does smaller servings, or you exclusively want a faster way to brew your coffee, the AeroPress will easily fit into your lifestyle. Consider picking this item up today.